Martial arts practitioners are a unique breed of people. The one thing we all have in common is unconditional love for and dedication to our teachers. This total respect comes with the territory when we choose to study these arts. Of course there is always an exception to the general rule, and there are those who only love themselves and show little respect for the teacher they have chosen. In my life I have seen students who dishonor their teachers to a point that would bring tears to your eyes. There is nothing that will break a teacher's heart faster than showing him or her disrespect. This is why when a break occurs between a student and his teacher it is something that is never forgotten by the teacher, or the student. This kind of disrespect is the mortal sin of the martial arts. All teachers understand this to be the worst possible occurrence between student and teacher. However, this article does not focus on the disrespect, but, rather on the respect and love between student and teacher. If you have been in the martial arts for a reasonable amount of time and have done a bit of self study, you may have noticed something that most overlook. Just about everything written about the great masters is redundant. There are two reasons for this. First, some masters lived so long ago that there is little known or written down about them. As time passed the masters died and those that knew them well also died leaving little more them a few pages of information about the person they called Teacher. Secondly, there are those who don't care to make the effort to document the exploits of their teacher, again losing information that true practitioners crave to know. All too often, the most you see are the same facts over and over again. In Great Grandmaster Ch'ang's case, we always see the same facts. 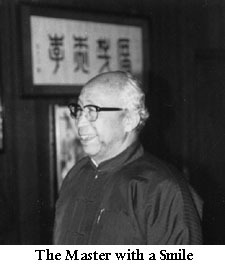 Ch'ang Tung Sheng was born in 1908, died June 17th, 1986. 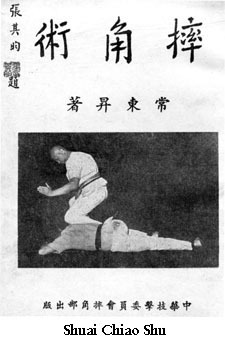 Master of Pao-ting Shuai Chiao, his teacher was the famous master Ping Jing-yi. In 1933, he won the National Kuo Shu Tournament, emerging as heavyweight champion of China. These facts tell you little about Ch'ang, the man. What motivated him? What were his beliefs? What were some of his personal insights in life? Who did he like and who didn't he like? How good was he, really? The available writing simply doesn't go into this kind of detail. This, I believe, is the first article you will ever read where a student talks about his teacher as a real person, and not a legend. 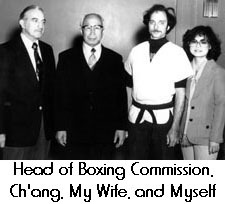 I had the good fortune to meet Ch'ang Tung Sheng many years ago while I was in Taiwan for a fight between myself and a well known Mei Jung Fighter, named Wu San Ju. I knew little if anything about the reputation of Ch'ang Tung Sheng other than what I was told before my journey to Taiwan by some of his dedicated students in America. Up until that time, my training had been mostly centered in America in New York's Chinatown district. Although I had many good teachers in the internal arts, Shao-lin, and Chinese Kenpo, I had had no exposure to Shuai Chiao. In fact I had not even heard of Shuai Chiao until my first trip to China. I got my first glimpse of Master Ch'ang when I went to a meeting with some noted martial artists in Taipei. We were discussing my up and coming fight with Wu San Ju. Unknown to me Ch'ang sat there quietly just listening to the arrangements being made regarding the fight. It was a well known Pa Kua master named Huang who told me Ch'ang Tung Sheng was there. Still, with all the plans being made for the upcoming fight, I paid little attention to him. I did approach him and introduce myself, and he greeted me warmly with a firm hand shake. However, nothing else transpired at that particular time. A few weeks later my fight took place and I was so involved in preparation for the contest that I paid little attention to the many martial artists who were there to witness the contest. Little did I realize that it was Ch'ang Tung Sheng who was the chief judge of the fight. Again he sat in the rear of the Kwoon just watching me during the fight. It was not until after the contest that I began to realize just who he was and how honored I was to have him as the chief judge. He apparently liked my fighting skill as he made mention of this to me, saying if the fight had continued I would have seriously hurt my opponent. Of course, I took this as a great compliment, but left it at that. The next day I had to return to the United States. It wasn't until my return trip to Taiwan that my relationship with Ch'ang Tung Sheng really took hold. I went there to make a motion picture with Wu San Ju called the "The Thirteen Style Strike." During the day I would work on the motion picture, and during the evening hours I would visit the Master. One day I was invited to a Shuai Chiao tournament and while sitting and observing the various contests, a teacher Lee (one of Ch'ang students) invited me to come and sit with Ch'ang at the head table. It was then that I was asked if I wanted to be Ch'ang's adopted son. To say the least I was totally taken back at the honor bestowed on me. By this time I was very well informed about who Ch'ang was. So many people had come to me and told me of his reputation and how great a fighter he was. I was totally confused as to why he would pick me for such a great honor. Today, in retrospect, I feel our relationship happened for several reasons. First, he saw my skills in action and was content I had attained some level of proficiency in Kung Fu. Second, I could never be a disciple of Ch'ang, as I already had teachers. The only way for him and me to formally connect was for me to become his son, according to Kung Fu Wu-De. Becoming his disciple would have put Ch'ang in the same level of quality as my previous teachers, and he was certainly far above them in Kung Fu status. Thirdly, I believe Ch'ang was beginning at that time to think about traveling to the United States and wanted somebody he could count on to help him display his skills to the American people. From this point on, I saw the man in a different light. For now I had the opportunity to get to know him more than most. I was now invited into the inner circle of the Ch'ang family. Behind all the stories and triumphs of Ch'ang I found the real man, not the legend, but a family man who deeply loved his country and family. Now the re-evaluations began to unfold as the veil of the Ch'ang legend fell away and the real Ch'ang began to emerge. With the official status of adopted son, I was allowed to stay close by the side of the Master. On many different occasions I was invited to his private dinners with the closest of his martial arts friends and inner-door students. We spent many nights eating and discussing martial arts and playing Ch'ang style Push Hands. The Master felt push hands was nothing more than a game to enjoy, harmlessly pushing people off balance. In real combat Ch'ang never pushed, he would strike. However, he liked and enjoyed showing his students how to deal with force and play proper push hands. He was well aware that this kind of practice had its purpose and indeed could be useful in learning about feeling energy. But, he made no big deal about its true usefulness as an efficient method of combat. He always said, when it comes right down to it, it's one's knowledge of how to strike and throw an opponent that counts. Ch'ang had an extensive knowledge of more art forms than I can count. He said he spent his youth traveling around China looking for the best of the best in martial arts. Master Ch'ang's mind was very sharp at picking out movements that were both particular for combat and not complex to master. The fancy arts never impressed the Master. According to Ch'ang they had too many weak points that could be countered by someone versed in an art such as Shuai Chaio and Chinese hand maneuvers. One time at his house he showed me the chart of Shuai Chiao which hung on his wall. He pointed and said, "There they are, all the basics of our Shuai Chiao. With these basics in mind and ready to use, the combinations of Shuai Chiao become countless in scope and ability to change." I understood his meaning, for although there are a limited amount of basic movements, the possibilities of combining and blending techniques become endless. Ch'ang's change-up ability was legendary. That is how he got the name "Flying Butterfly". He could change before you could react to his attack. One night in my home we were discussing how many techniques Shuai Chaio had in its arsenal, and he showed me a film of him doing a demonstration and fighting four men at one time. It was hard to believe or describe what I saw. He moved through what appeared to be countless techniques, never repeating any move more than once. Opponents were flying every which way, as Master Ch'ang moved so gracefully from one opponent to the next. His stepping and gracefully flowing arms captured each opponent up in a web of power and grace. Once Ch'ang laid his hand on you there was little chance for escape. His techniques were like the web of a spider, the more you twisted and pulled, the more entangled you became. I could see how appropriate was the name "Flying Butterfly" -- his moves were simply beautiful, fast and effective. Master Ch'ang's daily life in Taiwan was carefully planned. He knew when to rest and he knew when to work. When it was time to rest, he seldom entertained anyone. In fact in Taiwan you could only call on him at certain times of the day or night. If he was resting, nobody could get to see him or even talk to him by phone. His schedule for training, resting or social events were fixed and nobody could change that. Only if he felt something was worth the effort would he allow any changes to his life style. To get to see him was a major ordeal. Even if a person could get a message to him it was unlikely he would be seen. The only way to see Master Ch'ang was if he came to you, or he requested your presence at some function. There was always the eager martial artist trying to catch the eye of Ch'ang. With my own eyes I saw many a well known martial artist trying to enter the gate1 of Ch'ang. It was always a great event when someone was accepted as Ch'ang's student. A dinner of celebration was always in order to accept the new disciple into Ch'ang's fold. This dinner was paid for by the new disciple and Ch'ang would decide who was invited. At this dinner a special ceremony would take place with many witnesses to one's becoming his follower. The disciple would then receive a special shirt (see photo) with a patch denoting his status as a follower of Ch'ang Tung Sheng, and thereby under his roof of indoor disciples. Ch'ang Tung Sheng came to Taiwan from Mainland China during the great revolution. He left behind many of his family members including his younger brother who still teaches in Beijing. His brother is also versed in Shaui Chiao and I am told is quite good at his martial arts. 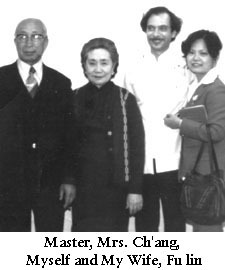 Master Ch'ang's new life in Taiwan soon became a life dedicated to his teaching of Shuai Chiao. The Master did not have a reputation for being a gentle man when it came to training or real life situations. There is a story that one day while the Master was training in the Taiwan Police College, a man wearing a martial arts uniform approached Ch'ang. He asked if he could have a lesson from the Master. Master Ch'ang quickly hit the man and threw him forcibly to the mat. It was a hard blow and a vicious throw that was not tempered. The man cleared his head and got up to admit he had come to test Master Ch'ang's ability. Ch'ang looked at him and said he knew this and that was why he was as rough as he was. The man could not understand how Master Ch'ang knew and asked him so. Ch'ang's reply was he had seen enough challenges to know when one was coming. The name Ch'ang Tung Sheng is known in the streets of Taiwan by anyone who has anything to do with Chinese martial arts. In fact, one day the Master and I were with a few Chinese friends, riding in a car bound for a dinner appointment. There was a near accident between our car and a taxi cab. The driver of the taxi cab got out yelling and shaking his fist in the air. The driver of our car went out to see if he could calm the taxi driver down a bit. However, it seemed to be growing into a confrontation, when Master Ch'ang stepped out of the car. He approached the taxi driver and whispered something in his ear. The driver looked like he had seen a ghost and simply apologized, jumped back in his car and left. It was later I found out what Ch'ang had said from Mr. Lee, a friend and student of Ch'ang. Lee explained that Ch'ang simply said, "My name is Ch'ang Tung Sheng and I don't want any trouble." It would seem that was more then enough to end any disputes in Taiwan. I was told his reputation as a teacher was so pervasive, even government officials came to him for instructions. It was not uncommon to see government cars pulling up to Master Ch'ang's house in the early morning to take him to a prearranged class he was teaching some high dignitary in the Taiwan government. Just prior to Ch'ang's coming to the United States a letter of introduction was given to me on Ch'ang's behalf. It was written by Chiang Wai Gwo, son of Chiang Kai-Shek, president of the Republic of China. This letter introduces Ch'ang as a leading citizen of China, and states that Ch'ang is renowned in his skills as a teacher. It goes on to say how respected he is in the eyes of the Chinese people and that to have such a man living in one's country is indeed an honor. This letter now hangs in my office at the main branch of A.C.C.S. affixed with the seal of Jang Wai Gwo. I often look at it, and I'm reminded of how well respected Ch'ang was and still is in the martial arts community. Although many knew of the name Ch'ang Tung Sheng, Ch'ang himself kept close with only a handful of people he trusted. One such person was Huang Guo Zhen, who is now in his late seventies. He is the son of a very good friend of Ch'ang named Huang Bo Nian1 (1880-1954) of PaKua and Hsing -I fame. It was Master Huang whom I called Uncle Huang. He was present when I became Ch'ang's son, as well as at many martial arts events and closed dinner parties with the Master. He was at one time a top man is the Chinese police department. Now I believe he is retired and still living in Taiwan. To learn under the Master's eye was indeed considered a great honor. Most of the time he would not personally teach any one individual. He had many assistants to do the teaching. He would observe the workout but seldom give personal input, that is unless he took a special liking to you. Even the well known author Robert W. Smith came to Taiwan to interview and train with Master Ch'ang with little satisfaction. All he attained from the Master was a powerful groin strike when he asked Master Ch'ang for a demonstration of his skills. Although Smith spent some time with Ch'ang he really never got beyond the fundamentals of Ch'ang's methods. To this day Smith never forgot his encounter and even wrote about it in his book entitled "The Way to Kung Fu, Chinese Boxing  Master and Methods." In his book Smith quotes Oliver W. Homes when he describes Ch'ang... "the subtle rapture of a postponed power." Smith further commented, "Ch'ang Tung Sheng was the most disciplined boxer I met. I never saw him smile and I seldom heard him speak." In reality, this was not the real Ch'ang. He did smile and he did speak. The face of Ch'ang that Smith saw was the professional side of Ch'ang, the side the general public saw. Not long after I returned from my second visit to Taiwan, Ch'ang decided to visit the United States and stay with me at my home in Putnam Valley. 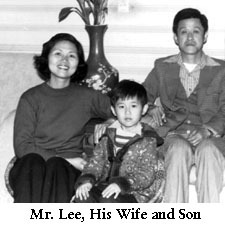 Since my induction into his family by special ceremony in Taipei, we now had a special relationship, and I was privileged to call him "PaPa." When he came to the United States he would stay for months at a time. Nearly all this time was spent in a small but adequate room I gave him in my home. Communicating with him was not difficult as I speak a little Chinese and my wife, who is Chinese, would help me when the conversation became involved. During this time together we began to learn a great deal about each other's ideas and lives. Master Ch'ang was, indeed, a kind man. Although he was often portrayed as a stern and serious faced man, when he was around those whom he considered close family, one could see him change from the stern faced man to a smiling and relaxed man who so loved his arts. His form of relaxation was to play Push Hands. Many a time we would gather in the living room after our evening meal and have some fun pushing hands. Needless to say he would always get the last laugh when he would push someone clear across the room. Although today many like to think they were close to Master Ch'ang and are under the impression that the Master taught them a great deal of his Kung Fu, this is not the case. In fact, Master Ch'ang rarely taught anybody much of his Kung Fu with the exception of his grandson, and a man called "Little Butterfly." He had a special feeling for his grandson, Ch'ang Da Wai, who was always eagerly learning and training in all Ch'ang had taught him. Many would have you believe that they learned a great deal from the Master, but, in reality, he was very slow to pass on information. My relationship with Master Ch'ang was such that I could get a little more training than most, only because he lived with me and we had a special relationship. I would press him day and night to teach me more. It was only through continuous pressing that I learned the little I did. When I say "little," I mean, compared to all that Ch'ang knew, I only got a small percentage. In fact, this was the case with most who knew him. Master Ch'ang was not the solemn-faced teacher most would think. He did enjoy life, and seldom liked to sit and relax. He was always on the go and I had a hard time trying to meet all his demands. He was a professional, in that Kung Fu was his life. He did little else but eat, sleep and practice Kung Fu. His only other outlet was his music. He loved to play the PiPa (Chinese instrument) and he was very good at it. He would often sit in my living room playing and singing classical Chinese songs. He would not allow anyone except himself to carry his PiPa, for next to his Kung Fu, the PiPa was very special for him. He loved Chinese Opera. On more than one occasion, while visiting New York's Chinatown, we would attend Chinese opera. Although this was not to my liking I had little choice but to sit there and look entertained. Great Grand Master Ch'ang lived in the old traditions of China. He seldom wore anything except his traditional Chinese clothing, except when he had a dinner to attend or a special occasion. Then you might see him dress somewhat differently. One thing he totally enjoyed was going out to dinner with students. He loved good food but was very particular about what he ate. He was a strict Moslem and he followed his beliefs closely. In fact, one time we went to a student gathering in America, with many of my students who wanted to see him. Before we sat down he went to the kitchen to be sure the pots and pans used to cook his meal were not used for cooking pork, which Moslems do not eat. He loved being with martial artists and felt more at home with them then he did with non-martial artists. He did drink wine, and most favored a Chinese wine known as Wu Jaou Pi. This was a strong wine that I had a few times in Taiwan, which I could not handle well, for on each occasion I had to be carried out. However, Master Ch'ang knew when to stop. Unfortunately I had less experience with this powerful Chinese brew. He only drank at meals and never indulged any other time. In fact, he never approved of students who had bad health habits. If he saw a student smoking he would give him a firm look to show his dismay. Likewise, if a student drank for the sake of drinking the Master would again show the same stern face of disapproval. He believed taking a rest in the afternoon was best for the health. He always had energy because he always conserved it. His approach to life was much the same as his approach to his Kung Fu, CONTROL of mind, body, and spirit. Although Master Ch'ang was a devout Moslem, he respected everyone else's beliefs. I myself am not a Moslem, but rather follow the Buddhist and Taoist beliefs. In fact in my home I have a Temple of the Tao, and when Master Ch'ang was living with me, I had many ceremonies with one of my teachers of the Tao. He never questioned my beliefs. In fact, he was happy to see I followed my spiritual training. He was very private in his beliefs and never imposed them on others. When Ch'ang taught he seldom, if ever, spoke of the spirit. The Master was more prone to teach the moves of Kung Fu rather then try to change or influence anther's spiritual beliefs. Even if he felt a student might be on the wrong track spiritually, he never said anything. Of course, he would always display proper Wu-De (ethics) and set the example of one who had developed the proper spiritual nature. He was extremely careful in everything he did and said. His words were very few, but they always had impact, especially among his disciples, who hung on every word the Master said. All his decisions concerning the proper martial arts ethics were soundly based on the martial arts code of behavior. There were times when I thought he had made mistakes in his judgments on martial arts matters only to be proven wrong in the long run. It didn't take me long to trust his judgment completely and confidently. To this day when I don't know what to do in certain situations, I ask myself, "what would the Master do in this case?" and usually the answer comes quickly. 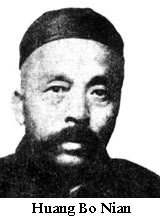 Ch'ang Tung Sheng was the typical master you might read about in China's old days. He was rigid, and trained far beyond what most people are capable of doing. I know this for a fact, for when he trained me he would expect hours of practice without let up. His Martial Arts were what he knew best and he loved them deeply. He was a very opinionated man when it came to his skills. Although he respected all martial arts, he felt Shuai Chiao was his ultimate skill. He did employ other methods, especially open hand strikes, but his finish was nearly always a vicious throwing technique. He was a strong man and well built. He was most proud of his strength and endurance, which few could keep up with. When he walked, his pace was such that many had to run to keep up with him. When he walked up a flight of stairs he would take two or three at a time, and students often found themselves far behind him. His strength even in his old age was something to marvel over. His body was rock hard and when he hit you he seldom held back. Although I was told time and again he was not trying to inflict damage when he trained me, I seldom felt anything but pain after a training encounter. It was around 1982 when the Great Grand Master came to the United States to spread his arts. Because I am a Police Officer, and head Defensive Tactics Instructors at the Police Academy, I was able to set up a series of martial arts demonstrations for the Police Academy. The Master did a number of these demonstrations, showing his skills. 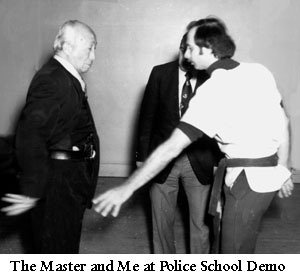 To this day the Westchester Police Academy uses a number of his self defense techniques that have remained on the training program. On one occasion, for his birthday, I bought him a walking stick, because each morning after rising he would do his chi kung exercises, and then take a long walk before having a light breakfast. I thought a walking stick would be appreciated. However, to my surprise the gift was not welcome, as it may have implied he needed a walking stick. Ch'ang proceeded to use the stick as weapon, and showed some striking techniques on me to demonstrate his points. He then said he really didn't need a walking stick. He continued to say that when walking in the woods he liked to pick up a large stick in the event that he might come across a wild animal bent on attacking him. The walking stick idea did not go over as well as I thought it would. The Master constantly moved and seldom stood still. You could see his mind was always working, always moving. Even in my car when we would travel to some special occasion he would be moving -- practicing or doing his chi kung. Master Ch'ang believed good health was a result of good practice. 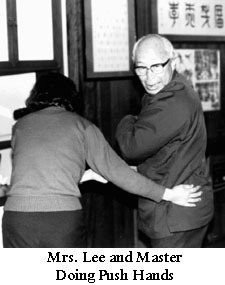 He always maintained his daily chi kung exercise, herb intake, and martial arts. He was indeed an expert in the use of traditional Chinese herbs. When it came to taking care of his health, his first choice was the use of herbs, then chi kung exercise. Even when his health did fail, just before his death, he refused to be treated by doctors but rather preferred herbs. Even in the face of death the Master followed his way. There is a saying I like to use: "The true test of your convictions comes only when you know death is imminent." The Master showed he believed in all he taught us, and lived his life and practiced his beliefs to the end. He lived a strong and healthy life style and followed his art. I often begged the master to teach more of his knowledge so as to preserve his concepts, but, the Master never felt pressured to pass on too much. Many of the famous Masters of Shao-lin history had much the same attitude toward divulging too much too fast. It could take a student more than half of his life before the Master taught him a great deal. The Master had high standards to meet before he would open up to you. I once confronted the Master by telling him if he didn't open up and teach more of his skills there could be a chance his art would be lost forever. I paraphrase his answer -- "If I don't find the right person to pass it on to, then the art will forever lie in the Ch'ang family name." Thank goodness over his lifetime the Master did find a handful of his students to show his Kung Fu to. It is my belief that now Ch'ang Da Wai (the Master's true grandson, and heir to the family name) knows the most of his grandfather's methods. The many students he has throughout the world would be the first ones to acknowledge how hard it was to get the Master to reveal what he knew. It was as if he taught you just so much and expected you to find out the rest the way he did, with constant perseverance and continual pursuit of knowledge. The Master, on many occasions, would teach a student little and leave him there to ponder and practice. If he felt he worked hard he would show a little more. If he felt he didn't practice, it would be a long time before anything else new came his way. In fact, on a few occasions, students who studied with the Master for many years would come to me to see what Ch'ang showed me. If it was something they did not know they would ask me to show it to them, because they knew Ch'ang would not. This trading of Kung Fu information is not uncommon in the martial arts world. We all seem to have the same intent as students of a great masters, that is: "Get All You Can Any Way You Can." Students, disciples, and even Masters are like starving people. We all crave knowledge, we wish to know what the legends of the arts know. We all like to think we know more then someone else. So we learn from every source we have in our martial arts family. The Master was slow to give and the students were fast on the search between each other. Only a few in Master Ch'ang's circle can say that the Master taught them privately and directly. There are few, if any, who can truthfully say they know what the Master knew. There is a story I can tell that illustrates my point: One day the Master told me we were going to Ohio to a Kung Fu Kwoon run by one of the Master's students. I bought the airline tickets and off we went. When we arrived at the martial arts school the students greeted him with a deep bow and a gift for his coming. The gift was a small bar of gold. I expressed to the Master how nice I thought the gift was. His reply was, "Gold you can put a price on, but Kung Fu knowledge you can not." The Master sat down and told me to teach the group. The only time the Master got up was when he gave a brief demonstration of his Shuai Chiao skills. The Master was never impressed by money, gifts, or high adoration of his skill. He simply taught when he decided to teach. On the other hand, when the Master was living with me, he decided to open a Shaui Chiao school in Putnam Valley. He told me to gather all the students I had and open a training hall. This I did, and we were soon having classes. The master had me lead the class, then he would show some of his movements and stand there and actually correct a number of the students. He enjoyed teaching in this school for some months. Then he had to return to Taiwan, and the school was closed. The Master could never be pinned down -- he was always moving. You could not say Master Ch'ang ever had a school which he ran and taught at exclusively. The Master's kwoon was Taipei, Taiwan. Ch'ang Tung Sheng rarely if ever put pen to paper and wrote about his art, or his background. I was told that the Chinese government wanted to write about his life story and he refused, saying he was already written into martial arts history. He was never one who was concerned about fame. Making the front cover of a magazine or writing martial arts books were never his interest. I remember that I once told him, when he was in the States, that I had the front cover of a noted magazine reserved for his picture and story. He gave me no reaction at all nor ever questioned me about the article. Even when it came out he looked at the front cover just in passing, but would not as much turn a page to see what was written. I had to show him page by page how good the final article looked. I could almost hear him say, "Masters are not on the front covers of magazines -- they are too busy training. As for books, there was only one book written by him to my knowledge, called "Shuai Chiao Shu," which translates to "Shuai Chiao Technique." It was published by the Shaui Chiao Community. As luck would have it the Master gave me a signed copy. Needless to say, I treasure this rare book, especially for what he wrote in the front cover (see photo) in his hand with his seal. It states, "To my adopted son, from your adopted father Ch'ang Tung Sheng." The only other book the Master signed with his seal of approval was the book I wrote called Ch'ang Shih Tai Chi Ch'uan, which bears his dedication and seal. The Master watched me every step of the way when I wrote the book on his Tai Chi Ch'uan. He reviewed every picture and every word. When I gave it to him for his stamp of approval, he gave it. To this day it is the only book the Master ever endorsed. For this I am most grateful and honored. 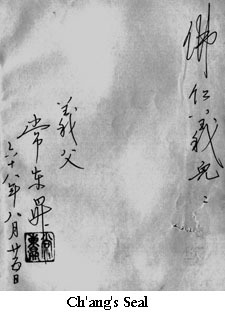 Although other students have written various text books on Shuai Chiao, the Master never approved of the books for many reasons. These books were later published after the death of the Ch'ang. In fact, much has been written about the Master since his death that bears little resemblance to the truth. But this is always the case after a Master dies. The war begins among the students and the truth becomes lost in a muddle of mistruths. Only those who were really there ever really know truth from that point on. The Master was slow to teach, as well as slow to take on new disciples. In fact at the time I met him he had only a handful of students that could call him their teacher. It was only around the early 1980's that Master Ch'ang began to take on more students. It is my guess that he felt the time had come to spread his art to the world. To do this he had no choice but to spread his concepts to more people. The Master's plan seems to be working, because now the name Ch'ang Tung Sheng is known in this country more than ever before. Those who met him have become advocates of Ch'ang's concepts. People like myself are teaching and writing about what the Master has left behind. Unfortunately much has been lost, but the dedicated few who remain are separately trying to preserve and cultivate the precious teachings of this great man. Yes he was only a man, but what a man he was. All who came in contact with this special individual will not likely forget the impression he made on their lives. But we must always remember he was not a God; he was not an enigma; he was just a man who refused to be anything less then great, and great he was. We must persevere and cultivate the Kung Fu we have learned from our Masters. We must remain committed to achieve the highest levels of human achievement. Realization and preservation are a matter of diligent effort and firm perseverance, striving on your own alone; but practice necessitates an equanimous mind and a lifelong commitment to lose yourself and help others. If the mind is not even and the commitment is not firm, then loss and benefit will be backward, and you will degenerate into a common mundane priest - this is something to beware of. To enter the gate means to be sanctioned by Ch'ang. It gives the new disciple the right to say he or she is indeed a disciple of Ch'ang Tung Sheng. 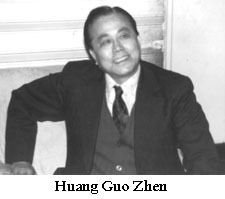 The story of Huang Bo Nian can be read in the Pa Kua Journal March/April 1994 issue. His fame is wide spread and he is the teacher of many well known martial arts masters in Chinese history, such as He Fu Sheng and Wen Jing Ming, to name a few. 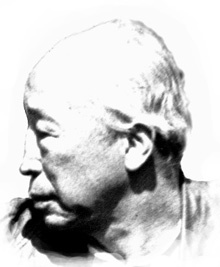 He also wrote the books Dragon Style Pa Kua and Routine of Boxing and Weapons.